This is my latest piece for the website of The Conversation. You can read it on their site here. I have recorded a short video introduction to explain why I decided to write the piece. Wilkes was writing specifically for a British audience. He could hardly have foreseen the news media of today, when his words could have been read on the other side of the world as soon as he posted them. He lived in the 18th century, an era of a different type of globalisation – one driven by ships sailing out to trade or conquer. Imagine Wilkes were to return to earth now. Let him set aside for a moment his inevitable astonishment at how technology has transformed journalism, and continues to transform it. He would still be dismayed at how little has changed. For there are plenty of “bad ministers” with “dark and dangerous designs” in many different parts of the world. Judging by the way things have unfolded for the news media in the last two decades especially, many governments continue to see the news media as a source of “terror” – not excluding the UK, which is slipping precipitously down the press freedom rankings. Wilkes presumably intended “terror” to mean extreme fear. In the case of Al-Jazeera’s Peter Greste, Mohamed Fahmy, and Baher Mohamed the word has, absurdly, taken on the meaning more often used since September 11 2001. I should disclose that Peter Greste and I are former colleagues at both Reuters Television and BBC News. Our previous professional association, as much as the reports I have read of his arrest and detention, means I use the word “absurdly” advisedly. Greste and his colleagues are on trial in Egypt charged with assisting a “terrorist organisation”. Needless to say, they deny the charges. Their trial has been adjourned until May 3 – a date which the United Nations has designated annual World Press Freedom Day. What is ominous for the cause of press freedom in general, and for individual journalists in particular, is the way reporters are so readily associated with the policies of governments in their home countries. Journalism does not operate in a vacuum separate from politics and diplomacy; in this case, the government of Qatar, which funds Al-Jazeera, supported the Muslim Brotherhood, the movement now driven from office and declared “terrorists” by the country’s current rulers. Meanwhile, Simon Ostrovsky, a reporter for Vice News, was detained in April by a pro-Russian militia in Ukraine. The reason, according to a report on The Guardian website was that he was “suspected of bad activities”. Thankfully, he was released, seemingly unharmed, a few days later. Ever since journalism began to take on its modern form, it has often been in conflict with political and military authorities. Yet the situation seems to have deteriorated in the past twenty years or so – the instability after the the Cold War and the wars which followed 9/11 proving especially hazardous for reporters. A 2009 report from the International Federation of Journalists (IFJ) took the title End of a Deadly Decade. The report highlighted areas which are less frequently covered in the western media: the Philippines, Somalia, and the drug wars of Mexico. All were the site of multiple media deaths, and all continue to be lethal arenas for reporters. Governments today face the challenge of coping with a media environment which is much harder to control than in the pre-internet age. New emphasis is placed upon media messaging, especially in time of armed conflict. The point is more generally relevant. Unlike The North Briton, much of today’s journalism is available around the world, around the clock. One consequence seems to be that reporters themselves are increasingly singled out. If you can’t muzzle the medium, you can jail the journalist – or worse. The result is that attempts to gag the news media have gone global: Egypt detains an Australian journalist working for a Qatari News Channel; pro-Russian forces detain a U.S. citizen reporting from Ukraine. The adoption of Resolution 1738 by the United Nations Security Council in 2006, which called for the protection of journalists in conflict zones and for proper investigation into violent attacks on media, has largely been ignored. So while World Press Freedom Day is welcome, action would be better. Armed conflict, economic uncertainty, climate change and all the other challenges the world will face this century need to be reported. Trying to do so should not carry the risk of detention or death. Twenty years ago this week, as a TV news producer in Moscow, I watched as the city where I had worked for much of the previous 18 months suddenly turned into a war zone. Political confrontation became armed conflict; demonstrations turned into a flash into riots. I am working on a longer account of that crucial week in modern Russian history for a future book. To mark the 20th anniversary, I am re-posting an entry I wrote earlier this year, with Egypt in mind, about the challenges of reporting revolutions. You can read it here. The photograph is taken from the window of the flat in central Moscow where I was living at the time. The centre of the capital city became a battleground. Tanks took the place of rush hour traffic. Shoppers and commuters passed soldiers warily peering around corners for fear of attracting sniper fire. Two years after the advent of democracy, political opponents took up arms to settle their differences. 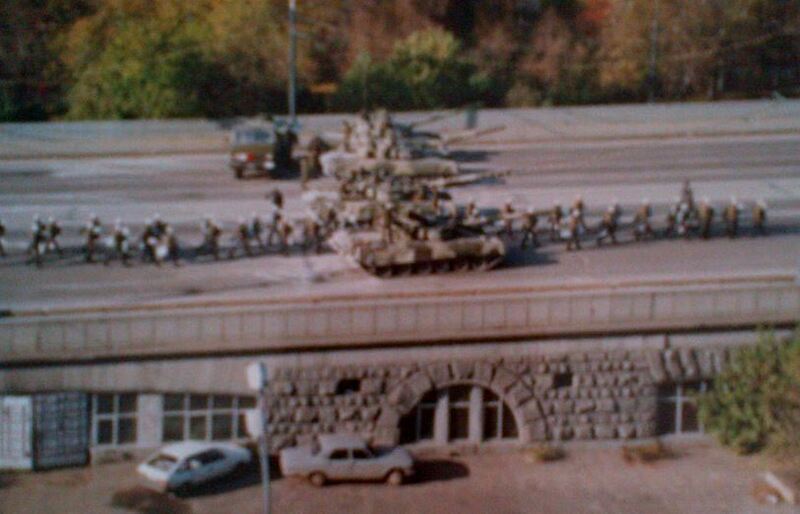 This was Moscow in October 1993, two years after the end of the Soviet Union. The idealism, the euphoria, which had accompanied that huge and unexpected change in the summer of 1991 was gone, and it has never returned. Russian public life in the post-Soviet period has perhaps been best described by then President, now Prime Minister, Dmitry Medvedev, when he spoke of the need to confront his country’s ‘legal nihilism’. Two years ago, after Hosni Mubarak had been deposed as Egypt’s President, I met a number of Egyptian activists at a conference in London. Their optimism and idealism was infectious, but I was reminded of other twentysomethings I had seen in Moscow, twenty years before, celebrating the collapse of Communism. They did not, and have not, got the country they expected then. The truth is that revolutions take a long time. They are not over in a moment, or even a year. Orlando Figes’ history of the Bolshevik Revolution of 1917, A People’s Tragedy, has as its subtitle ‘The Russian Revolution 1891-1924’. A history of the end of the USSR would probably need to look at an equally long period before and after 1991. How long will it be before we can judge the consequences of the Arab uprisings? This makes reporting them difficult. Not necessarily in the sense of day-to-day hard news: there is usually plenty to say, plenty of drama, plenty of human interest. The challenge lies in trying to interpret events that no one really understands – whatever politicians and expert analysts might say – in order to explain to audiences what the possible outcomes are. Speaking about Egypt on the BBC’s Today Programme this morning in the UK, the Foreign Secretary William Hague used the phrase ‘strategic patience’: good for policy makers, perfect for historians – all but an unaffordable luxury for journalists facing hourly deadlines. Perhaps the hardest challenge is to see the full picture. Reporters focused on the events as they unfold in capitals do not see the provincial towns and villages where populations may be less enthusiastic about radical change. Social media – credited with such an important role in Egypt that the events of 2011 have even been referred to as a ‘Facebook Revolution’ – do mean that more voices are much more accessible to journalists. In a country where only about a third of the population has access to the internet, how representative are they? Russia and Egypt are different countries, their revolutions at different times in history. Yet there are parallels: a military/ security establishment reluctant to give up power, and a population yearning for some degree of economic stability, and prosperity. In Russia, that led to a former KGB officer, Vladimir Putin, being elected President in 2000. He holds that office today, and many other powerful men in Russia apparently share his background. That was not what people were marching for in the early 1990s. It is what they ended up with. Russia’s young democrats found that in the blood and bullets of October 1993. President Yeltsin may have stayed in office, but innocent idealism was dead. The ‘Facebook’ revolutionaries look unlikely to get any real power in Egypt, however this current crisis develops. President (former President?) Morsi and his supporters may now feel it applies to them to. ‘We know it won’t last’ could be a good guiding principle for anyone reporting on a revolution.